When you think of wild horses, your mind is either cast to the wide open prairies of the American mid west, or to a popular song by the Rolling Stones. 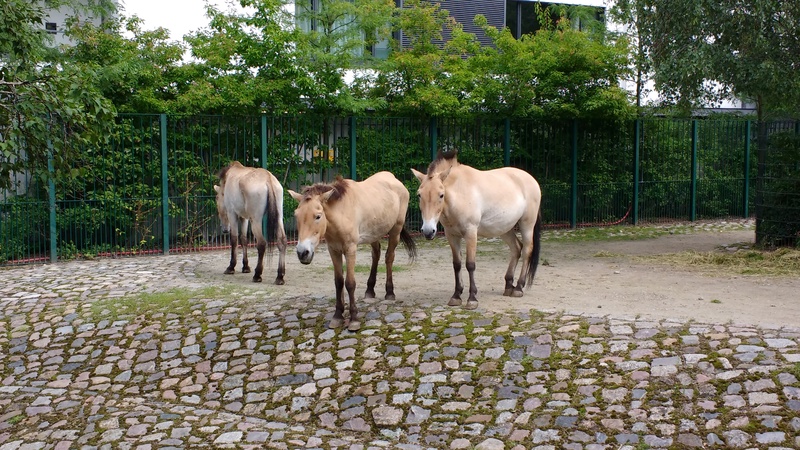 However, the last truly wild horse species in the world cannot be found in Nevada or Utah, but instead on the rolling steppes of Mongolia (or in this case in the Berlin Zoologischer Garten). Horse varieties commonly thought to be wild, such as the Mustang, are in fact descended from domesticated horses brought to America during colonisation, which were later released and adapted to their environment, making them a breed of domesticated horse, E. ferus caballus. The Przewalski’s Horse, on the other hand, has never been domesticated, and is a separate subspecies of horse, E. ferus przewalskii. Named after the Russian explorer who first reported them, the Przewalski are normally dun coloured horses, with pale bellies and dark manes, and are stocky in build with shorter legs than most domesticated horse breeds. Their behaviour is not so different from that of their close cousins, staying in small family packs led by a dominant male, although they exhibit a few properties that many species in the Central Asian share, such as a far more nomadic and migratory lifestyle than most horses, and possibly the ability to slow their metabolic reactions in winter, entering a form of semi-hibernation which allows them to survive when there is little grazing to be found. Most interesting of all is the low genetic diversity of the Przewalski’s Horse. During the 1900, these animals saw a decline in their numbers due to hunting, competition with herds of grazing livestock, some particularly harsh winters and even the conflicts of WWII, and by the late 60s, only two populations survived in the world, at the Zoos in Munich and Prague. All examples of Przewalski’s Horse today are the descendants of the 15 or so individuals in those exhibits, which has created a genetic bottleneck that increases the likelihood of detrimental mutations expressing in the subspecies on a large scale. Luckily, like the Arabian Oryx, which was reduced to 7 individuals in the past, the horses are doing well in reintroduction programs to areas of Siberia, Yakut and Mongolia, and enjoy a large population in the Chernobyl Exclusion Zone, created after the Chernobyl nuclear reactor experienced a meltdown. The fact that Przewalski’s Horse has been able to come back from so few individuals with the help of conservationists is a real inspiration. I hope we will continue to replicate this success with other endangered species across the globe.